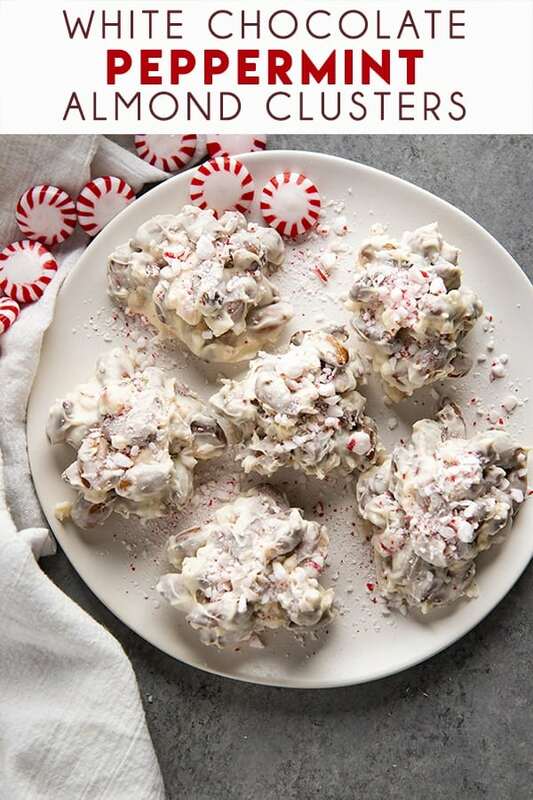 White Chocolate Peppermint Almond Clusters are such an easy to make candy for Christmas! Smooth and creamy white chocolate coats roasted almonds and crushed peppermints! 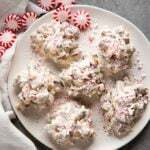 These almond clusters are such a fun treat for the holidays, although they are totally rich and decadent and something I’d be happy to eat any time of the year. 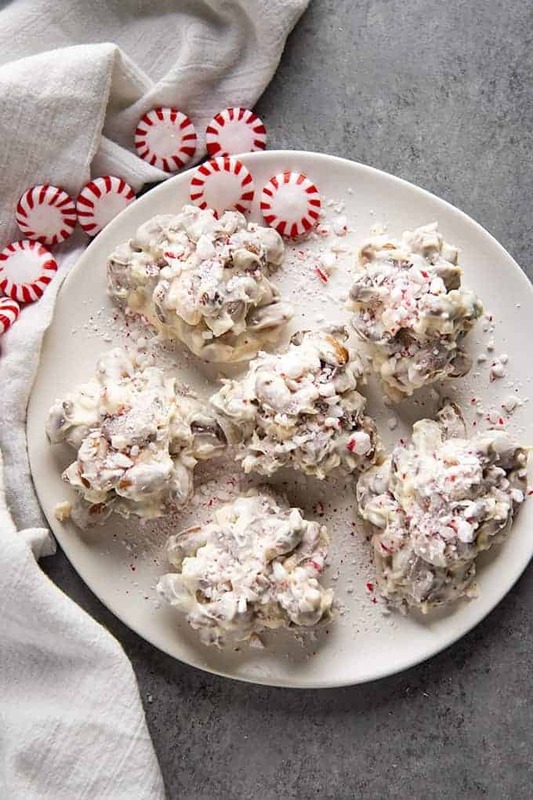 I love a good peppermint dessert like these clusters and my peppermint Christmas Dip! 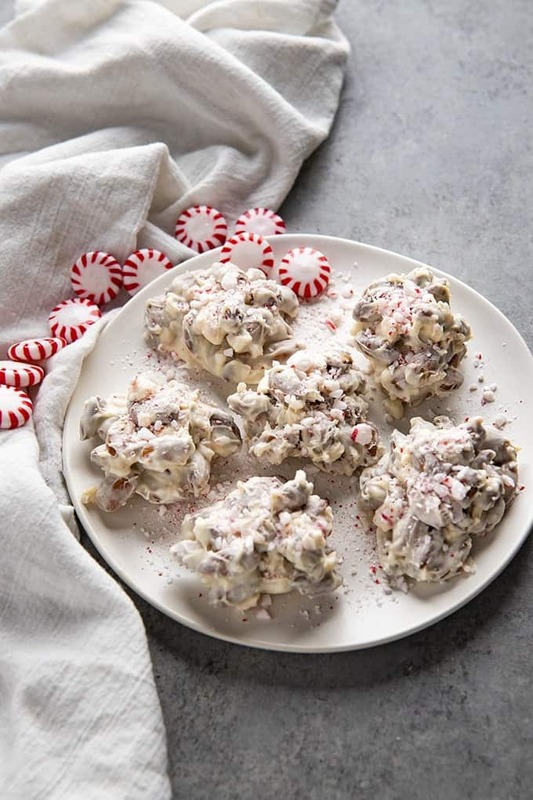 Almond Clusters are so simple to make, even if candy making isn’t your thing, you can definitely handle these! 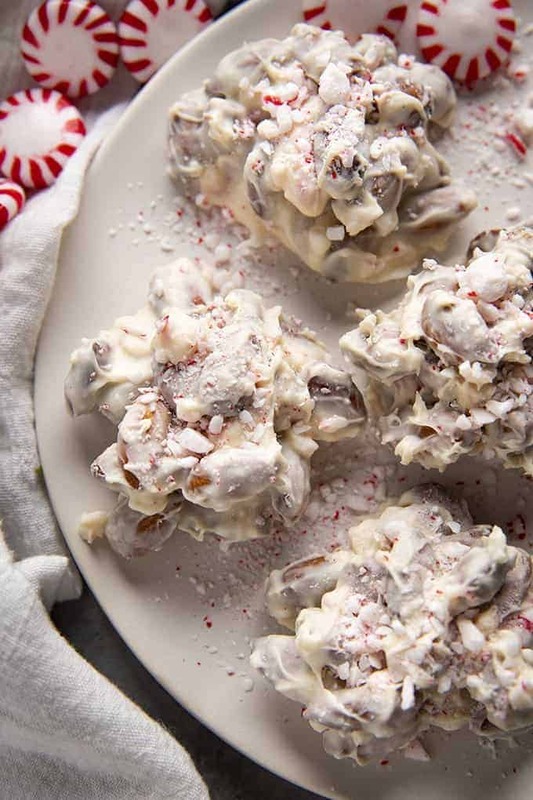 Only five ingredients total in this recipe: vanilla almond bark, roasted almonds, crushed peppermints or candy canes, vanilla extract, and salt! You will love the crunch of the almonds with the combination of creamy white chocolate and smooth peppermint! Start by filling a medium saucepan with about 1 inch of water and bring it to a simmer over medium-low heat. Rough chop your almond bark and add it to a shatterproof bowl that will fit tightly on the top of the saucepan. Set the bowl on top of the pan of simmering water. Stir the chocolate with a spatula just until melted and smooth, then remove from the heat. Alternately, you can add the chopped almond bark to a microwave safe bowl and melt in the microwave. You will want to do this in 5-10 second intervals, stirring in between. Only heat until the chocolate is smooth, stir well to make sure no chunks remain. After your bark is melted, stir in the vanilla, salt, half of the crushed peppermints, and the almonds. Drop the mixture by spoonfuls (whatever size you’d like) onto a parchment or wax paper lined baking sheet. Allow them to cool completely, then store in an airtight container for up to two weeks. Place the almond bark on a large cutting board and chop into chunks. Fill a medium-sized saucepan with one inch of water and bring to a simmer over low heat. Place a tightly fitting, heatproof bowl on top of the saucepan. Add the chocolate to the bowl and allow the chocolate to melt while stirring occasionally until completely smooth. Remove the bowl from the heat and stir in the salt and vanilla extract. Then, stir in the roasted almonds and half of the crushed peppermints. ALTERNATELY: Place the almond bark in a large microwave-safe bowl. Microwave the bark in 5-second intervals, stirring in between just until melted. Spoon the clusters onto the prepared baking sheet in mounds of whatever size you prefer. Sprinkle the remaining crushed peppermints over the top. Allow the chocolate to set completely then remove the clusters to an airtight container and store for up to 2 weeks. NOTE: This recipe will make anywhere from 12-20 clusters depending on what size you make them. These were a HUGE hit at Grandma’s party! She loved them. These would be great to make for my friends and neighbors too! They look amazing! We have so many peppermints and candy canes left over from Christmas and I have been wondering what to do with them. These clusters are just the thing! These would be so hard to resist! A perfect treat for the holidays! Such a fun holiday treat!